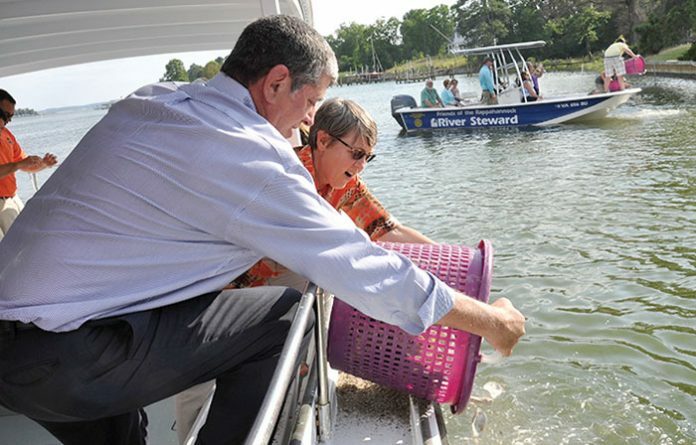 IRVINGTON—A one-acre reef on Carter Creek created from reclaimed oyster shells brought state dignitaries and conservation officials to the Tides Inn for its dedication last Thursday. The rock is named after the late W. Ellery Kellum, who opened W.E. Kellum Seafood in Weems in 1948. State officials added Ellery Kellum Rock to the Virginia Treasures list last Thursday during an afternoon reception and sign unveiling. The event featured boat rides to the reef, where 20 bushels of oyster shells were added to the 3,000 bushels of oyster shells already placed on the reef. The reef was a dream of T. Kellum’s, according to Tides Inn general manager Gordon Slatford. But it was the anonymous workers behind the scenes, “the Freds and Fredericas [who] are the ones that really make things happen,” he said. Virginia Secretary of Natural Resources Molly Ward told the crowd of about 100 “the important thing tonight is the collaborative effort that made this possible.